Give all your dishes a unique flavour and aroma thanks to this amazing truffle salt. Use: add at the end of the cooking time to avoid any loss of aroma, over scrambled eggs, omelettes, carpaccios, grilled fish, fresh goat’s cheese, etc. Delicious in mashed potato or on a boiled egg. 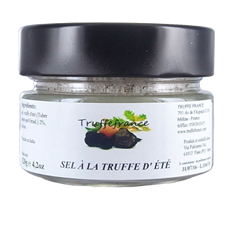 Ingredients: food preparation based on grey Guérande salt 99%, freeze-dried summer white truffle (Tuber Aestivum) 1% (5% fresh truffles), aroma.